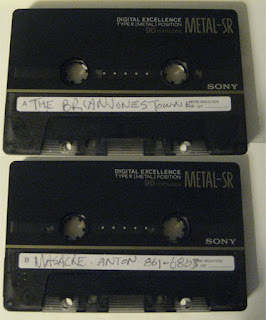 Leaked online earlier this month, this cassette demo is now the earliest known BJM recording. The tape, released 3 years before the band's first official studio album, is as raw and noisy as you might expect, and yet from the opening moments of the first track is undeniably the Brian Jonestown Massacre. This is a great listen for Anton Newcombe fans and it has a great story behind it. 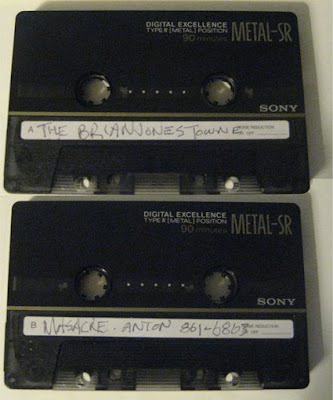 If you've somehow stumbled across this blog and have never heard The Brian Jonestown Massacre, I'd recommend heading over to The Committee to Keep Music Evil and picking up a copy of Take it From the Man before diving into this demo. Definitely not in print, so wtf? your welcome :) btw i named the tracks based on the versions off the "Pol-Pot's Pleasure Penthouse" album. the last track is the only song i havent heard anywhere else before, but sounded like an alternative rendition of the song "Space" so i just titled it "Space (Demo)"
The link is down again :/ Normally I'd just go take it from youtube myself, but if you've already got it cut up into songs, can you try and put it back up? Bad Indians - The Path Home 7"